Are you looking for a reputable and experienced Fairfax veterinarian that you can trust with all of your cat or dog's health and wellness needs? If so, you've come to the right place. 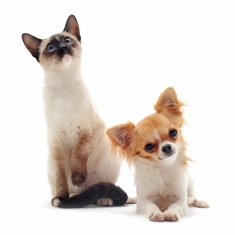 Here at Fairfax Mobile Veterinary Care, we specialize in providing the best veterinary services, right to your door. If your pet is like most, there's a good chance he or she doesn't enjoy being loaded up in the car and taken to the vet. House pets, after all, are very routine-oriented creatures. They don't typically enjoy being whisked away to unfamiliar places, let alone being poked and prodded. This is where working with a mobile veterinarian can make all the difference. When you work with our Fairfax mobile veterinarian, you allow your pet to receive treatment from a trusted and experienced veterinarian—all in the comfort of your own home. This helps to cut down on a lot of the stress and anxiety associated with traditional vet visits. Not to mention, mobile veterinary care is much more convenient when it comes to your busy schedule. Furthermore, taking advantage of our pet house calls means you can also reduce the risk of exposing your pet to any contagious diseases or illnesses that may be present in your typical veterinarian office's waiting room. If your pet is in need of a more involved surgery, such as spay and neuter procedures or other surgical procedures, Dr. Saini will begin with an in-home consultation at your convenience. From there, all routine and major surgeries will take place at an affiliated animal hospital. The same applies to X-rays and lab work. In the event that your cat or dog experiences a medical emergency, we can refer you to a qualified local animal hospital. From there, Dr. Saini will work directly with the animal hospital's team to ensure that your pet receives the best possible care. Furthermore, in the event of non-life-threatening but significant medical situations, Dr. Saini is available six days per week for urgent care calls. Overall, trusting a mobile veterinarian for your pet's health and wellness needs is a great decision. If you're looking for an experienced and compassionate veterinarian serving the Fairfax and surrounding areas (Loudoun county, Arlington county, Prince William County, and Northern Virginia), don't hesitate to contact Fairfax Mobile Veterinary Care today at 703-772-1263. We would be happy to schedule an appointment or answer any questions you may have about our practice. We are also proud to offer discounts to senior citizens and animal rescue groups in the area. At Fairfax Mobile Veterinary Services, we treat your pets like the valued family members they are.